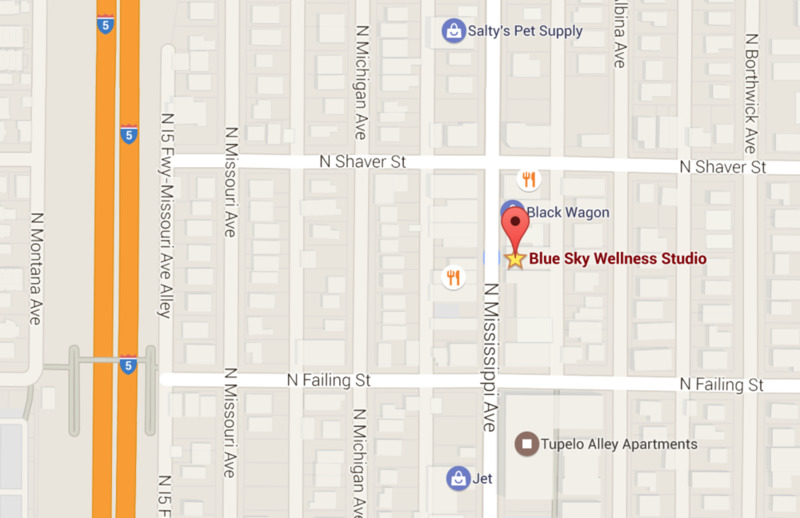 We are located in the heart of the historic Mississippi shopping district. We are close to I-5, off exit 303. From exit 303 / N Alberta Ave, go south on Albina Ave. Albina will become Mississippi Ave. We are south of N. Shaver St, before N. Failing St. in a blue painted building on the East side. We are across from the music venue, Mississippi Studios. Please note: Only on-street parking is available! Please give yourself an extra 5-10 minutes to find parking, if you are driving. If it is your first time coming to this neighborhood, please give yourself an extra 15 minutes to possibly get lost and then find parking. You will also need to complete intake forms prior to treatment. You can do this from home, or plan to arrive in enough time to do them before your treatment start time. We recommend looking on side streets for parking as needed. Parking can always be found, but is tougher on evenings and weekends. Walking, cycling and tri-met will help you avoid this! Compute your directions on Google Maps.